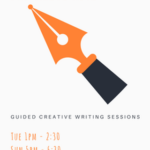 Sunday late afternoons in St Margaret’s House Room G8 we’ll hold a space for anyone looking for a calm place to write. To make a silver pendant with a cabochon stone you will be shown jewellery making techniques such as cutting, filing, rollprinting, soldering and bezel setting in silver. You will create a pendant, on a chain, to take home at the end of the day. 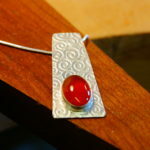 To make a silver pendant with a cabochon stone you will be shown jewellery making techniques such as cutting, filing, roll printing, soldering and bezel setting in silver. You will create a pendant, on a chain, to take home at the end of the day. Learn the wet moulding technique to create a unique, durable – and comfortable to wear – mask out of veg tan leather for your event, costume, or simply decoration. 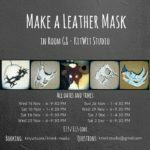 In this course, you will be guided step by step through the design, creation, and decoration of a leather mask that is virtually indestructible and fitted to your features for a comfortable wear.